It is the Little Things that Matter..
Week 8 has arrived in my weight loss journey! I can’t believe that two months ago I had gastric sleeve surgery and began my lifestyle transformation. I have lost 36 pounds and feel incredible! *Less food really is good! Just by adding a little variety to my protein-centric meals, makes all the difference. A teaspoon of goat cheese or a tablespoon of salsa adds a much-needed and much appreciated taste to ordinary chicken or tuna. *Every pound lost counts! Losing three and a half pounds a week is wonderful, but there have been weeks and there will be weeks when I lose less or perhaps not at all. I’m learning to think of my weight loss in smaller goals. Thinking of the weight loss in terms of every ten pounds, not the 112 pounds I plan to lose, helps me maintain a positive attitude. *Moving around is easier! I met my hubby for lunch downtown and I noticed the walk from the parking garage to his office was quicker and easier than before my surgery. Going up and down two flights of stairs for every load of laundry isn’t as hard, either. Noticing these little movement improvements is inspiring. I can’t imagine how I’ll feel when I make my goal! Another size down! While I’m still shopping in the plus section, I’m in the smallest size they offer. It’s truly the little things that matter! *Clothes shopping isn’t as bad. 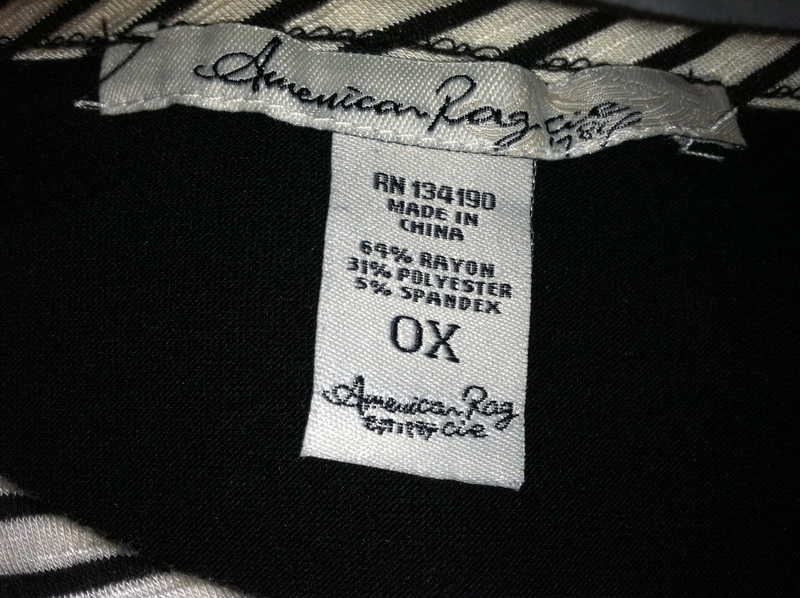 While I’m still shopping in the “plus” section, buying clothes is better. Going down a size or two feels amazing. I even survived bathing suit shopping. I actually don’t know anyone who likes bathing suit shopping, including my healthy weight friends. I was able to find a suit I like and I’m looking forward to swimming for the first time in years. Getting ready to go out for my first party, post-sleeve! Food has always been an important part of my life, but moving back to California made food even more important. San Francisco is a “foodie” town and we have tons of great and interesting restaurants. I think our grocery stores here have a better variety of food. And of course, there are the farmers markets which are the best I’ve seen. Having these resources wasn’t particular good for my health when we first moved. For the first year and a half, we ate out and picked up take out food more than we should have. Having a cheap and tasty take out dim sum restaurant close to the house made weekend lunches very easy. Coffee shops are on almost every corner so it’s easy to pick up a sugary espresso drink at any time. Way too many options! Since I can’t make these places go away, I am learning to live with them and still have them as part of my life. I don’t foresee the dim sum restaurant in my near future and perhaps not at all. I haven’t had any fried foods since my gastric sleeve surgery and I’m not sure when or even if I will have it. I am trying to be very careful with my new stomach. And my fear of vomiting keeps me in line, too. I did venture back to the farmers’ market this past weekend for the first time. It was great! Surrounded by beautiful, healthy fruits and vegetables was inspiring. My focus is on eating enough protein, but I am adding in more vegetables now. My big treat of the day was picking up my favorite Serrano chile goat cheese. Instead of eating it with wild abandonment, I measured out a teaspoon to spread on my half a turkey burger the other night. Suddenly, a teaspoon is enough to get the flavor I enjoy. This weekend, I finally realized that smaller amounts of food are just as satisfying and enjoyable as the large amounts I ate before. For this overeater, this revelation is a bit overwhelming. My biggest food test was at a party this week. Let me just say this right off the bat, I love wine. I love parties so that I can try new wines and relax and be an adult and not the mommy. Yes, I can drink wine with my new stomach, but I must admit I’m nervous to try. My overprotective nature with my stomach is one reason, but also I have a feeling I’m going to be a really cheap date. Meaning, the two to three glasses I could drink before, I assume will put me in a coma. So, the first time I drink I plan to do it at home. If I don’t feel good, I’d rather be in my home and if a half a glass makes me silly, again, I’d rather be home. So, no wine at my first party post-sleeve and I was fine. I drank water all night and while it isn’t as yummy as a crisp class of chardonnay, I survived. I was too busy chatting to really care! I also didn’t eat. I made sure to have a protein filled dinner before we came to the party. I did bring vegetables and humus to the party, but I didn’t eat anything. I could have if I wanted to and I think that made all the difference. Knowing I can eat if I want is empowering and I realize I am in charge of my actions in regards to food. We did leave before they served the birthday cake, so I did get off a little easy. Again, this is something I can eat, but I haven’t had sugar for 7 weeks, so again, this is something I want to try at home. The thought of me bouncing around like a child eating sugar for the first time is mortifying and not something that I need to do in front of family and friends. And I must admit, the sugar-free items I’m eating now (syrups in my lattes and hot chocolate) satisfy my sweet tooth and I would prefer to keep it that way. Eventually I would like to drop them and use natural sweeteners, but I’m happy where I am for now. 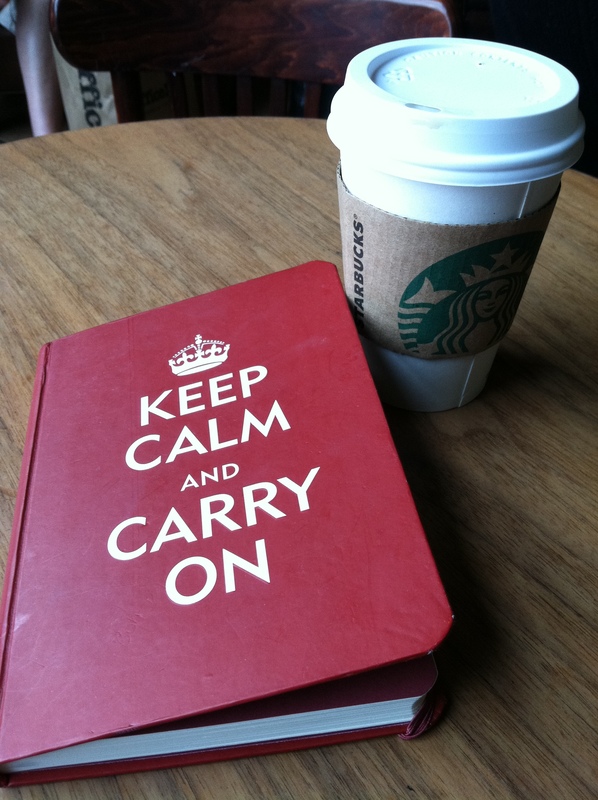 My new Starbucks treat, Skinny Hazelnut Latte, and my journal with one of my favorite sayings! I woke up this morning full of dread and excitement. Week six is here which meant time to weigh myself. My gastric sleeve surgeon recommended only weighing in once a week, but I must admit I’ve cheated and checking every few days. I jumped on the scale on Saturday and I was only down about a half a pound. Needless to say, I wasn’t a happy camper. This morning I was a happy camper though! For the week, I’m down three and a half pounds! This makes a total of 29 pounds for six weeks! Yes, I’m finally happy and not feeling blah about it. I realize more stalls are going to be part of my journey, but I’m learning to enjoy the victories, however large or small. My biggest victory of the week is that I’m learning to live with my new lifestyle. No, I’m not perky or feeling successful all the time, but I’m coming to terms with the new normal. This means eating healthy food in small quantities. My favorite meal is three slices of Trader Joe’s Oven Roasted Turkey lunch meat with a Roma tomato. Not very exciting to most people, but after eating pureed foods, it’s heaven and healthy. Another part of the new normal is learning when I’m full and listening to my body. As a lifelong over-eater, this is still is a strange feeling for me six weeks after surgery. And when I’m full, I am full. Eating too much is extremely uncomfortable and even with the magic pink Gas-X pills, it doesn’t automatically go away. I am getting better at this each day. One of the biggest challenges I have dreaded is eating out. No, I haven’t been cooped up in my house this past six weeks, but I have brought food each time we’ve gone out during mealtimes. Of course, that’s the best thing to do since it gives me control over what I’m eating. This past Friday, I decided to throw caution to the wind and not bring lunch when I took the kids on a day trip. We went to California Pizza Kitchen for lunch and I did great, if I may say so myself. Yes, the kids had pizza and I was OK sitting across for them with as they ate. I ordered the Chicken Lettuce Wrap Appetizer. Yes, I wanted pizza, pasta or anything with gooey cheese and meat, but I knew it wouldn’t be worth it. I ate one lettuce wrap and was full and satisfied. I was surprised to be full from one, but I was proud of myself for not eating more! I took my time eating and engaged with my children more than I used to when we ate out. Being a mom, I tend to spend more time getting my children settled with their meal and then wolfing down my food. This time I ate my meal slowly and could truly enjoy it and my kids. Another big change was not finishing the food on my kids’ plate. Really, pizza crusts aren’t that good so why was I eating them before? Another bad habit I’m breaking! Another food habit I’ve changed is my coffee intake. I drank one to two cups a day at home and went to Starbucks or Peet’s three to four times a week for a sugary espresso drink. I don’t drink coffee at home now and I go out for espresso once or twice a week for a sugar-free drink. No caffeine headaches and I feel like I have a treat when I get my coffee when we’re out. This new normal is amazing. The Last Week of the Blahs…I Promise! Week five of my gastric sleeve surgery journey is here and I hate it. I’m not a happy camper and I’m trying hard to get over it. I’m worse than my kids when they want to play their computers and I say no. I’m an instant gratification kind of gal and it’s not happening this week. I’ve only lost one pound this week. Yeah me, I should say. Losing is better than gaining, right? But I went through an invasive, expensive surgery that has caused me and my family, time, money, and emotions. I researched online about post-op sleeve results and I know a slow weight loss or even no loss is very common. I just didn’t think this would happen to me. I’ve always had great results from all the weight loss programs I’ve done. I don’t think I’ve had a week during a weight loss program were I didn’t lose weight; the problem has always been maintaining the weight loss. It’s the knowledge that my sleeve will help me maintain my eventual goal weight that is keeping me going now. Also, that as impatient of a person I am, I am also a fighter and a planner. When I want or need to accomplish a goal, I go after it with determination, drive and a bit of crazy energy. Time to wipe the tears off my thinner face and go for it. I am having successes even if they’re not showing up on the scale. For one, I feel so much better. It is easier to keep up the with kids when they ride their scooters through the park. I’ve started walking on my own for exercise and it feels wonderful. I know I’m almost ready to start running and that makes me happy. Stairs are much easier to manage, even the two flights I climb to do each of the six loads of laundry my family magically creates weekly. Not carrying 25.5 pounds of fat really does make moving easier. I know I look different. My face is less puffy and my body is smaller. The biggest NSV (non-sleeve victory, as it’s known in the gastric sleeve world) is I’m down two pant sizes and one shirt size. Shopping for a few pieces of clothing last weekend was exhilarating. The closer I get to shopping in the “normal” women’s section the happier I am. 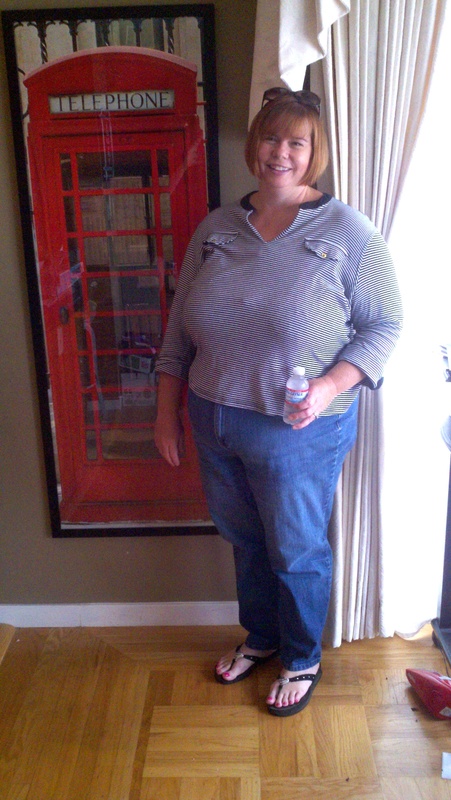 Week 5 with pants two sizes down and a shirt one size down. Yeah to non-sleeve victories! 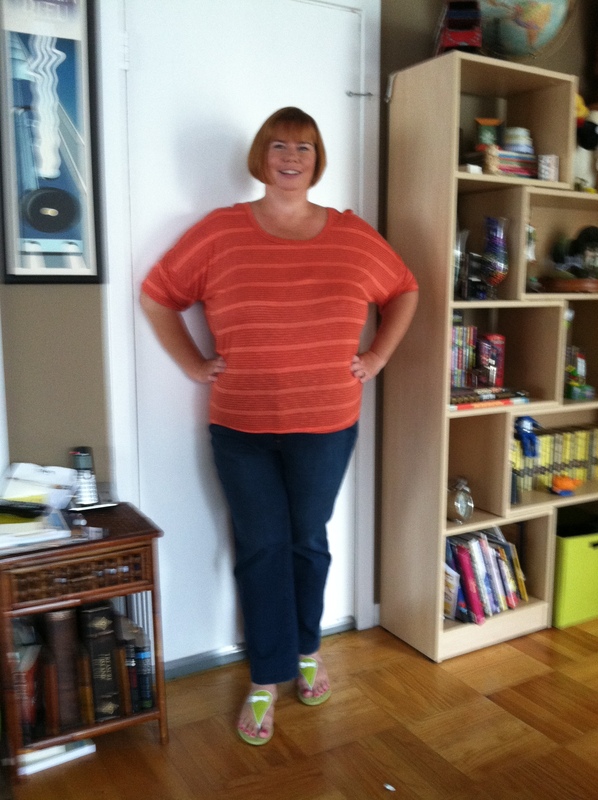 Today is my four-week anniversary of my gastric sleeve surgery. I should be celebrating with balloons and confetti! Well, not confetti, since I would have to clean it up, but you get the point. And while I am happy and still don’t regret my surgery, I’m not feeling that excited about my success so far. “What the hell is wrong with me?” I asked after I weighed in this morning. I’ve lost 24.5 pounds and gone down one clothing size and one shoe size. Not too shabby for a month! As it is with most things, I wanted more. I wanted this huge statement, like 30 lbs! I wanted this huge difference in my body! Here are my photos from before and after so far, and my hubby promises me there is a difference. I do see less puffiness in my face and since my jeans are falling off I know my body has changed. 3 days after my surgery. I had my pity party this morning, so now it’s time to give myself a swift kick in my now smaller rear. I feel good and my body feels healed. “Real” food is part of my diet although I’m nervous to try too many new foods. Fear of gaining weight and vomiting is helping me take this new part of my food lifestyle slow. After doing the Optifast liquid diet for six months, I threw up for about three months afterward so I’m erring on the side of caution. My focus is still on protein so chicken, real chewable chicken, is my mainstay. What I know is really going to inspire me is exercising. I have been walking, but I’ve been given the OK from my doctor to start really exercising. Fast walking is on the schedule and then back to running. I have a new phone and new headphones so I can start back on Couch to 5K. This year, I’ll be ready for the Thanksgiving 5K race. Last year I did finish, but I was not ready physically or mentally for the race. I vow to be prepared this year and really enjoy it! I realize this next month will be filled with new challenges like eating out. If I can spend two weeks on a liquid diet and then two weeks with pureed foods, I can handle anything can’t I? Yes, I can! I am the little engine that could….with a smaller caboose.